According to a recent research report by Motilal Oswal Securities Ltd, volumes in November were expected to get a boost as the company planned to make up for a loss in production in December owing to a plant shutdown. 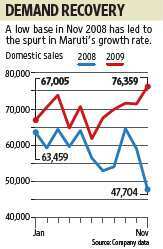 On a month-on-month basis, therefore, sales are practically flat. Sales in December 2008 stood at 52,030 units, also representing a low base, and hence growth numbers should look impressive at least for another month. From January, the base would rise to 67,000-70,000 units, and growth numbers would start looking less spectacular. Still, volumes are likely to inch upwards from current high levels. A number of the company’s models have a waiting period for delivery. Demand in both rural and urban areas has been strong, spurred by easier availability of financing for car buyers. Besides, the company has also been spreading its rural marketing network. As a result, Motilal Oswal’s analysts expect earnings growth of only around 11% in the year till March 2011, compared with growth of as much as 66% in the current year. At current prices, the stock trades at around 20 times estimated earnings for this fiscal, which looks expensive. But then, Maruti is the only pure play on the Indian passenger car market, and this factor is likely to keep interest in the stock high—at least as long as the volumes story is intact.